The authentic footwear started in New England in 1906 to help people correct foot troubles. Since then, eschewing expensive marketing campaigns, NEW BALANCE has made steady and persistent efforts to improve product quality and offer “genuine athletic footwear.” it has now grown to a footwear maker with its constant brand image and incomparable quality even to attract fashion celebrities. 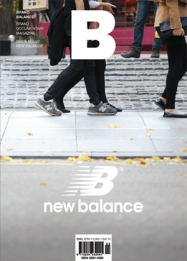 As a timeless fashion item, as well as footwear that bring balance to life, NEW BALANCE is always with its customers.